for research and commercial growing needs. 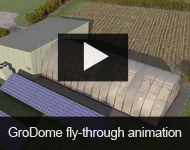 From contained greenhouses and growth chambers to clean rooms and walk-inchambers, its GroDome and GroRoom facilities incorporate an array of advancedtechnologies with exceptional financial and environmental benefits. environmental control throughout the facility. and built to the relevant UK and European standards. requires absolute attention to detail and foresight. Unigro is a leader in controlled environmental technologies such as contained greenhouses, growth chambers, walk-in chambers and other research facilities. Unigro is a member of the Billings Group, an organisation with more than 40-years experience in farming applications and construction projects. Within this partnership Unigro can access a range of skills and disciplines, which means our clients benefit from a full service solution for walk in environmental chambers and clean rooms. From design to construction, Unigro provides state of the art controlled environmental chambers and glasshouses.